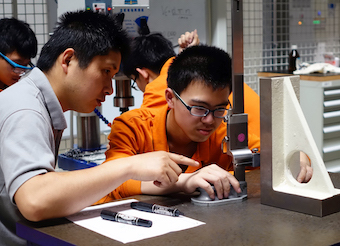 Engel is also training its own future skilled workers in China. At present, 45 apprentices are undergoing training as CNC, mechatronic and plastics technicians. Record sales in fiscal 2016/17 at injection machine supplier Engel look set for continued growth in coming years if the company’s capital investment program is anything to go by. Speaking at the pre-Chinaplas press event in Guangzhou, Gero Willmeroth, Sales and Service President at Engel Machinery Shanghai noted that capacity for machine building is being expanded at the company’s main plant in Schwertberg, Austria as well as its large machine plant at St.
Valentin through an overall investment of EUR400 million through to 2020. In Shanghai, meanwhile, Engel is adding 1600 m 2 of production space as well as an apprentice workshop and more office area. The expansion will be completed by September. “Building work in Shanghai progressed well over the winter,” says Willmeroth. “We plan to inaugurate the new production hall together with our customers and partners in September.” This is already the second major expansion since Engel Machinery Shanghai was established exactly 10 years ago. The new apprenticeship workshop at Shanghai will train technicians over three to four year courses. At present, 45 apprentices are training there as CNC, mechatronic and plastics technicians. In terms of production activity, “We shipped out 1000th large injection machine built in Shanghai in October 2016, having opened the plant in May 2007,” says Willmeroth. “We expect the next 1000 to come within three years.” The 1000th injection machine was a 4000-t0nne machine for auto end user in China. Currently, 20% of Engel’s sales are in Asia, including Wintec brand machines, with 24% in the Americas and the majority of 55% in Europe. Moreover, 85% of Engel machines sold in Asia are also made there, and this ratio is set to rise further to 90% according to Willmeroth. “The markets in Asia have played a big role in the success of the Engel Group,” sais the directors of Engel at the start of the Chinaplas 2017 trade fair, where Engel traditionally announces its annual results. “Asia grew faster than average in the last fiscal year, primarily due to China. On top of this, we are benefiting from the strong momentum in Southeast Asia,” says Chief Sales Officer Dr. Christoph Steger in Guangzhou. At the same time, growth in Europe continues unchecked and demand in North America increases further. The directors of the Engel Group expect further growth in the new business year, albeit at a somewhat lower level than in the recent past. Apart from injection moulding machines, robots and other automation solutions, the system solutions tailor-made to meet the requirements of the respective applications include process technologies, peripheral systems, molds as well as software solutions for digitalisation and networking. the potentials for efficiency and quality particularly well by adapting all components in the manufacturing cell to each other exactly right from the start, thereby strengthening the competitiveness of its customers. The development of customised injection molding solutions necessitates not only especially deep technological know-how, but also an understanding of the particular industry, which Engel ensures with its business unit structure. At its headquarters in Austria, Engel maintains separate teams dedicated wholly to the requirements of the automotive, technical molding, teletronics, packaging and medical industries respectively. More than two years ago, Engel also started to entrench industry-specific know-how locally at its customers’. As a first step, unit managers were appointed in North America for the five business units, and currently, Engel is introducing a business unit structure in Asia. Remote maintenance and condition-based predictive maintenance are just two of the possibilities leading to closer cooperation in after-sales. At Chinaplas, Engel presented both its established as well as new innovative smart service solutions. “Industry 4.0 is rapidly gaining importance here in China,” says Willmeroth. Engel has fully developed products that have proven themselves time and again around the world for all three parts of the smart factory – smart machine, smart production and smart service – thereby enabling it to fall back on vast experience in this field.